Watkins Glen is a small town in New York famous for its auto race track and its State Park south of Seneca Lake in the Finger Lakes region. During my summer in Manhattan we visited Watkins Glen State Park for two hours and I widely enjoyed it. If you are into some hiking, this is a magnificent place to do it. 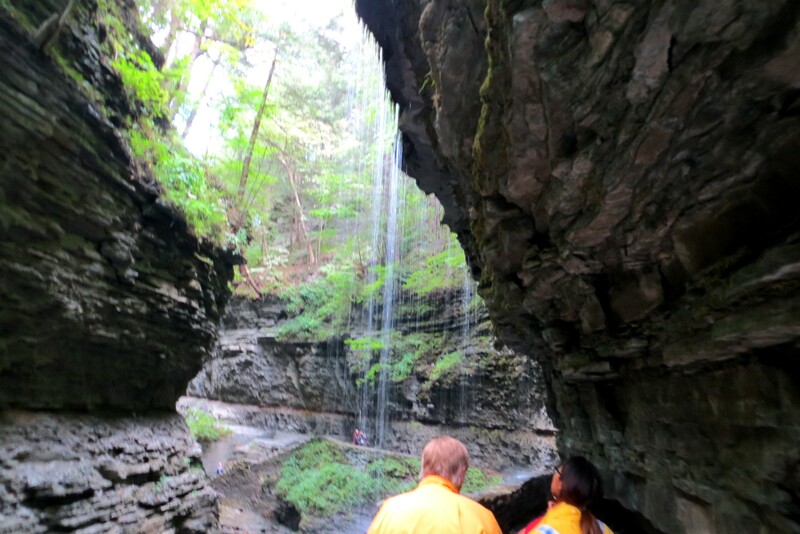 You will love the gorge trail, bridges, tunnels and walking behind some of the waterfalls. The trail offers a breathtaking experience with its sights and sounds of nature. There are 19 waterfalls created by the two miles stream that descends 400-ft past 200-ft cliffs. It is a path that will transport you to a peaceful state of mind and will make you forget everything else. You are just concentrated in the hike, the smell, the moss-covered stones, and sound of rock and water. This is a tourist location and do expect to be a little crowded in the summer. The 1-2 hours hike is easy and fun but elderly and kids might get tired during the more 800 steps. Guide said it was easier to descend instead of climbing, however you can do both since other tourists said views are more breathtaking while you ascend. Best time to visit is spring, late summer or fall. Recommend taking the three day bus tour from Manhattan to Washington, Philadelphia, and Niagara Falls. It stops at Watkins Glen State Park for a few hours. You can bring a light jacket (if you do not want the mist to wet your t-shirt), the most comfortable non-slippery shoes, and a bottle of water.